Kitchen Exhaust Hood Cleaning in Ontario CA | Flue Steam Inc. 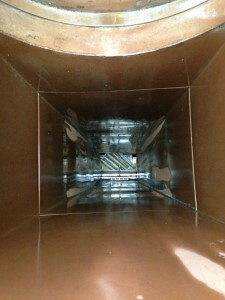 Kitchen exhaust hood cleaning in Ontario CA may seem simple enough. However, this doesn’t mean that you should trust just anyone to perform your kitchen exhaust hood cleaning. You need the help of pros like Flue Steam if you want to get a truly thorough cleaning. Because we offer other services like grease filter exchange service, steam cleaning, and exhaust fan repairs, we can quickly and easily address any other issues we may discover during your routine exhaust hood cleaning. The primary benefit of a kitchen exhaust hood cleaning in Ontario CA is removing grease and reducing the risk of a fire. If grease is allowed to accumulate on your exhaust hood or deep within your exhaust system, you risk it getting superheated during cooking activities and suddenly catching fire. The less grease is in the system, the lower this risk becomes. Another benefit of cleaning the exhaust hood is that it can help reduce odors in the kitchen. Come watch the pros from Flue Steam work next time you call us for kitchen exhaust hood cleaning. You’ll be amazed how much grease we can remove with a simple and affordable hand-scraping.